Rolawn is Europe’s largest producer of cultivated turf and is also recognised as Britain’s leading supplier of safe, certified high-quality topsoil. 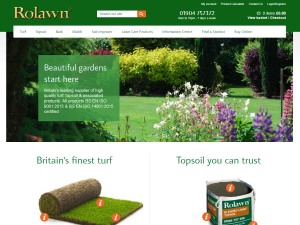 The Rolawn brand is the recognised benchmark of quality and service, with the company’s reputation having been established over 40 years. Rolawn’s renowned Medallion turf is Britain’s biggest selling and most frequently specified, being the first choice for both professional landscapers and experienced gardeners who demand the best. Rolawn’s Blended Loam is also Britain’s biggest-selling quality topsoil. Rolawn’s range also includes lawn seed and fertiliser, soil improver, mulch, and landscaping and play-grade bark. Selling products all year, with prompt nationwide delivery, Rolawn Direct prides itself on its friendly and efficient service.